By the mid-1930s, U.S. commemorative coins were nothing new: in fact, the proliferation of issues was beginning to be viewed with disdain by many collectors. In light of the blatant and unbridled commercialism and controversy associated with many of the earlier issues, even Congress started to look negatively upon the commemorative coinage program. Unfortunately, the situation would get even worse as the decade wore on. One man who was often in the center of this maelstrom but still managed to emerge unscathed by any allegations of impropriety was L.W. 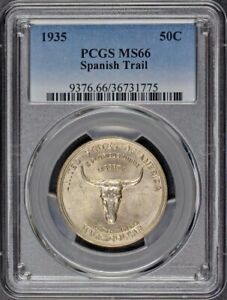 Hoffecker, a Texas coin dealer who would later serve as president of the American Numismatic Association (1939-41). Hoffecker was well aware of the growing resentment among collectors who, in the pursuit of complete collections of Mint issues, were being taken advantage of by the various commemorative committees. 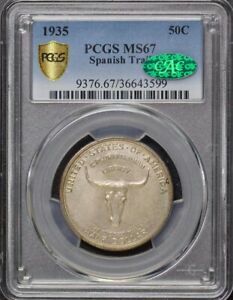 A large number of coins had been issued celebrating insignificant events and often in multiple varieties, solely to generate more money from the numismatic community. More a part of the problem than the solution, Hoffecker himself secured Congressional approval in 1929 for a half dollar celebrating the Gadsden Purchase, but he saw his plans aborted when President Hoover vetoed the bill. Determined to succeed in his quest for a coin, Hoffecker went searching for another event to commemorate and began a program of Congressional lobbying to assure passage of his proposal. In his capacity as Chairman of the El Paso (Texas) Museum Committee, Hoffecker found his event. Re-writing history to suit his own ends, Hoffecker claimed that El Paso was the end of the Old Spanish Trail traveled by early explorer Alvar Nunez Cabeza de Vaca and the remnants of an 1527 Spanish expedition. It apparently made little difference that the actual Old Spanish Trail followed an entirely different route than that taken by Cabeza de Vaca, and furthermore, the year (1935) picked to celebrate its 400th anniversary had little historical relevance to the dates (1528-1536) of the early explorer's travels. Obviously, Hoffecker's public relations campaign with Congress swept right past these "minor" details, as legislation was passed on June 5, 1935 authorizing a maximum of 10,000 half dollars commemorating just such an occasion. In the early decades of exploration in the New World, Spain sent out fleet after fleet of galleons across the Atlantic in search of treasure. In the winter of 1527-28, an expedition of 700 men and five ships led by Panfilo de Narvaez searched unsuccessfully for gold in what is present-day Florida. Within a year, almost 300 men had succumbed to the ravages of disease, hostile Indians and violent storms. After the bulk of the crew was blown out to sea in a storm, about 80 survivors, including the expedition's treasurer, Alvar Nunez Cabeza de Vaca, regrouped on Galveston Island in November of 1528. Over the next eight years, Cabeza de Vaca and his ever-dwindling band of surviving crew members wandered throughout the Southwest. They lived among friendly Indians at times, and at other times were held as slaves. Finally, in April 1536, Cabeza de Vaca and his Moorish companion, Estabanico, wandered into a Spanish military patrol in northern Mexico. An account of the group's adventures was recorded in a book that saw wide circulation at the time, Los Naufragios, and this in turn popularized the Old Spanish Trail. 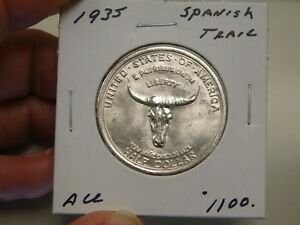 Hoffecker had a specific design in mind for the Old Spanish Trail half dollar, and after some searching recruited local El Paso sculptor, Edmund J. Senn, to execute his plans. 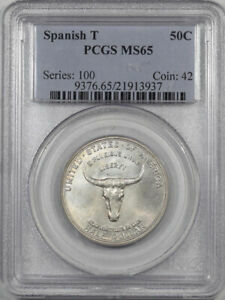 Because Senn only carried out Hoffecker's design concept, his initials were not placed on the coin. Instead, Hoffecker's initials (LWH) are seen on the lower reverse at the border, to the right of the date 1935. No other commemorative design has been so widely criticized. Some critics, including Cornelius Vermeule, have all but called the coin's design banal. Much of this stems from the use of a head of a cow as the central device, serving as a metaphor for Cabeza de Vaca (Spanish for "head of a cow"). Allegedly, this unusual name was inherited from an ancestor who used a cow's skull to mark a mountain trail, enabling the Spanish army to defeat the occupying Islamic forces. As a reward, the Spanish king re-Christened the shepherd and all his descendants Cabeza de Vaca. 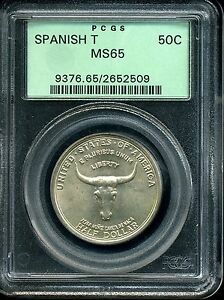 Directly above the cow's head on the coin's obverse is the legend LIBERTY and above that, the motto E PLURIBUS UNUM. Below is the explorer's name ALVAR NUNEZ CABEZA DE VACA. 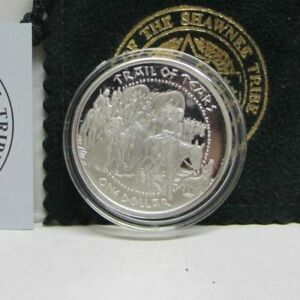 Encircling the rim are the inscriptions UNITED STATES OF AMERICA and HALF DOLLAR. The reverse displays a map of the southern United States from Florida through Texas with the Spanish Trail marked off across five states, ending at EL PASO. Continuing his disregard for historical accuracy, Hoffecker designated stops along the trail at cities that did not exist in the early 16th century. Superimposed on the map is a blooming yucca tree, a common plant in the desert regions of the southwestern United States. At the bottom of the reverse are the two dates 1535 and 1935. The legend OLD•SPANISH•TRAIL appears at the top border and the motto IN GOD WE TRUST is to the right of the yucca tree. 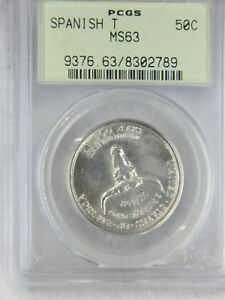 The full authorization of 10,000 coins (plus 8 pieces reserved for assay) were struck in Philadelphia in September of 1935. They were distributed through the El Paso Museum Committee for $2 apiece. Until recently, it was commonly assumed that Hoffecker was even-handed in the sale and distribution of the Spanish Trail halves. When the coin dealer's correspondence was sold and later published, it became known that favoritism played a role in the sale of these coins just as it had with other, previous commemorative issues. In 1954, Hoffecker stated that he only had twelve coins remaining from the original mintage, and he intended to save these for his grandchildren. This was clearly false, as 49 coins were sold out of his estate in a Pullen and Hanks sale in 1982, and another 63 pieces were auctioned by Superior Galleries in 1987. Other than these coins, however, no other hoards have surfaced. 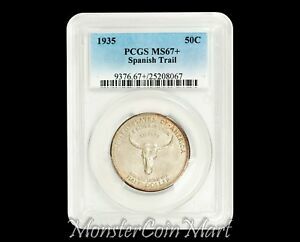 Regardless of any distribution shenanigans that may have occurred, the coins were widely distributed, with the vast majority sold to collectors. 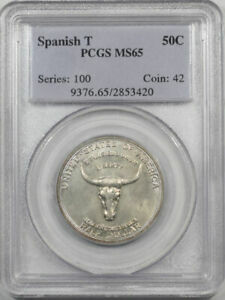 As a result, most Spanish Trail halves encountered today are MS-60 or better, but this issue can be quite challenging in the higher Mint State grades. 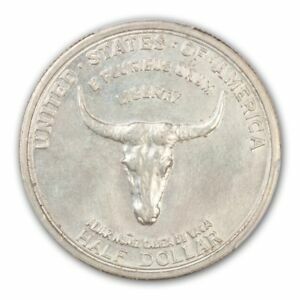 Because of the large, open fields, they are especially susceptible to nicks and abrasions that might otherwise go unnoticed on a coin with a busier design. Abrasions and friction are first noticed on the top of the cow's head and in the center of its face. 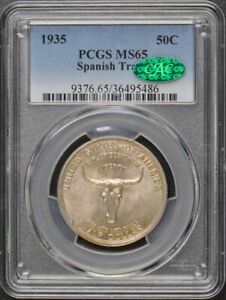 The popularity of this coin with collectors has also resulted in at least two types of counterfeits: One is cast and shows porosity over the surfaces; the other displays field irregularities and bright, semi-prooflike surfaces. 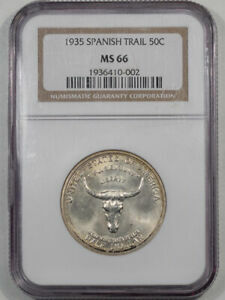 Genuine Spanish Trail halves do not have reflective surfaces, and any coin that displays such characteristics should be immediately suspect. 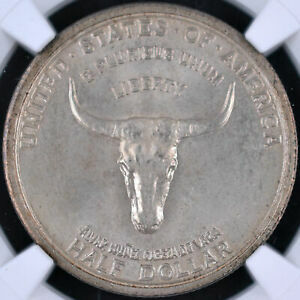 Two fine-grain matte proofs are known, but these have not been seen since 1956: They have extraordinarily strong details on the yucca tree and cow's head, and the surfaces have an almost chalky appearance. 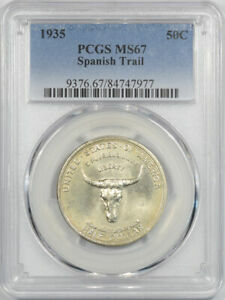 Like many of its contemporaries, the Spanish Trail half dollar was essentially a private venture struck in the U.S. Mint. 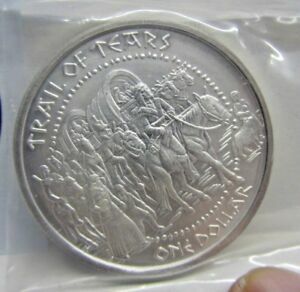 But with its relatively low mintage of only 10,000 coins, it has proven to be one of the more popular commemorative issues. 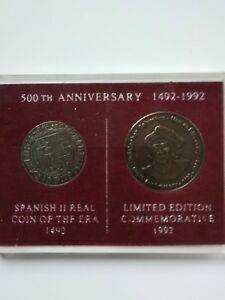 As it was only struck in one mint and during one year, it is a necessary coin for anyone attempting to complete either a type set or complete series of the commemorative issues. 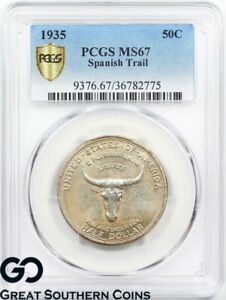 And with its distinctive Southwestern design, the Spanish Trail is one of the few halves sought by collectors other than commemorative specialists.